eat run sail: My 10 Travel Musts... I Don't Leave Home Without Them! 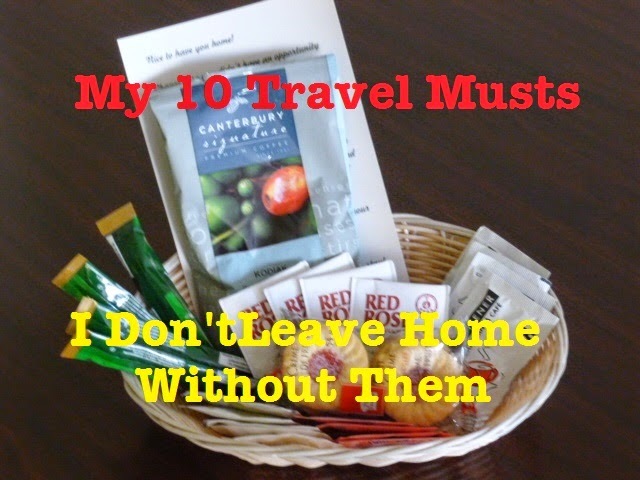 My 10 Travel Musts... I Don't Leave Home Without Them! I love to travel, and over many, many years of travelling both for business and for pleasure, I have become pretty good at packing. I recently spent a week in Las Vegas and managed to go with only a carry-on suitcase and a large tote (small purse inside). And I had room for a bit of shopping even with that. I don’t always travel light but this trip I was determined not to waste time waiting for baggage to come off my plane, or take the chance of having my luggage lost. I made do with only two dresses and one pair of dressy shoes, but it was worth it. As it turns out, Las Vegas is not all that glamorous! I did take trial sizes of my favorite cosmetic items and relied on the the hotel hair drier, but all in all it worked out well. There are some things that I cannot do without though, and will always make room for. Nope, not my new smart phone, or my laptop, or even my favorite lip gloss and mascara. Oh sure, I would definitely take some of those things, but for the most part, I could either do without them or replace them if necessary. 1. Protein powders, a shaker, healthy snacks. Good protein powders are versatile enough to be a meal or a hearty snack. I usually choose those that can be made with water, and in a couple of different flavors. This time I packed several VEGA ONE nutritional shakes in chocolate and vanilla chai. The shaker can double as a water bottle if necessary. I also like to pack some nuts and bars. I never rely on airplane food and don’t like to be caught hungry anywhere at anytime! This is the only cold sore lip remedy that has ever worked for me and I cannot find it for sale anymore. I have a few tubes left from previous shopping trips thankfully. It’s active ingredient is Zincum Oxydatyn 2X, HPUS. Yes, I have tried others but they don’t seem to be as effective. If I get run down or am out in the sun too long without a good sunscreen on my mouth, I am in danger of a breakout. If I put this on when I first feel a tingle, I am confident that it will not develop into a full blown blister..
On shorter trips I don’t pack lots of vitamins but do like to have zinc/vitamin C lozenges for those times I am feeling a bit run down. They also soothe a sore throat, or one that has been around too much cigarette smoke. yuk. When space is limited I don’t take the jars, but put a few spoonfuls of each in a baggie and label them. I take the Natural Calm mixed in water every night before bed… and when I am particularly active, during the day as well. It is a magnesium citrate powder. It prevents leg cramps while I am sleeping… so that I CAN sleep. I take the Fermented L-Glutamine mixed in water when I get up in the morning. It is a great start to my day and also supports muscle comfort and recovery. I rely on these supplements every day at home so would never be without them. 5. Plug in water heater, instant coffee, and tea bags. I normally stay in hotel rooms that have coffee makers or Keurig machines, but they don’t always leave me enough coffee and I hate having to go out for it. Instant is not my favorite, but it is better than nothing when I need a cuppa. And sometimes I just want a cup of tea. I usually take both black tea and herbal blends. The water heater plugs into the wall socket and brings a cup of water to the boiling point in about a minute. These little bits of spirulina algae are a good pick-me-up or just a snack when I need a little something. I hate being caught without them. This medical grade rehydration powder is a must. I like to take it on days I am flying or driving long distances and don’t gave an opportunity to drink enough water. It is also great for long days on my feet sight-seeing or sitting in meetings. It comes in two flavors and both are tasty... and one of the best things about it is that it has no salty taste like some other electrolyte formulations do. I have found that this is the best linament to use on aching muscles. Period. It comes in many forms and formulations. I use the ones that do not stain my clothing or bedsheets. I know this sounds crazy, but eating a spoonful of mustard stops a muscle cramp in its tracks. I KNOW! I have used it several times when I have over-taxed the leg muscles. Pickle juice works too but is much harder to pack! There is nothing that feels better after a long day on my feet than having a hot bath and then slipping into some TC compression leggings… It feels like a giant hug. I take along a tee shirt too. I wish they would start making a body stocking! Do you have a good cold sore remedy? Would love to know what it is in case I cannot get more of mine. Ha who knew about the mustard!! Love the tip about mustard. I had never heard that before! I DID NOT know that mustard stops muscle cramping...SO interesting! Love all your must haves- I also bring my vega packets and shakers with me when I travel! Wow! You are very prepared;) I definitely would put my phone on my list since it is also my camera and lip balm. Mustard- life's secret weapon! I assume you want me to eat it or do I start smearing it everywhere? I always pack snacks you never know when there will be a delay! Super cool travel tips. I have never tried the energy b its... but have been thinking of trying it. AND... mustard packets!? I had never heard that before. Neat! O my gosh! I love tiger balm!! Mustard! Who knew! I love Coromega3 fish oil squeeze packs for travel. I had no idea about the mustard! I always pack only a carry on so I never have room for anything that is not a necessity. My mom always packs that tiger balm! She brought it to vegas and I forgot to put it on before the race! I have never heard of a plug in water heater! I love it! Great list! Who knew about mustard?! For cold sores, the Herpes virus feeds on arginine so taking some lysine supplements can help destroy those little virus cells. Good luck! Wow I never go on trips this prepared. I typically wing it or have no intention of being on my best behavior. LOLOL!!! I'm lucky if I remember a granola bar when I'm packing! I'm quite impressed by your "take care of yourself" packing list - I definitely need to try that drip drop stuff. Mustard works for leg cramps? Wow! I just learned something new! I'll have to bring some on my next marathon. Great list! I always have to bring some sort of energy something...I love FRS & Vega Pre Workout.